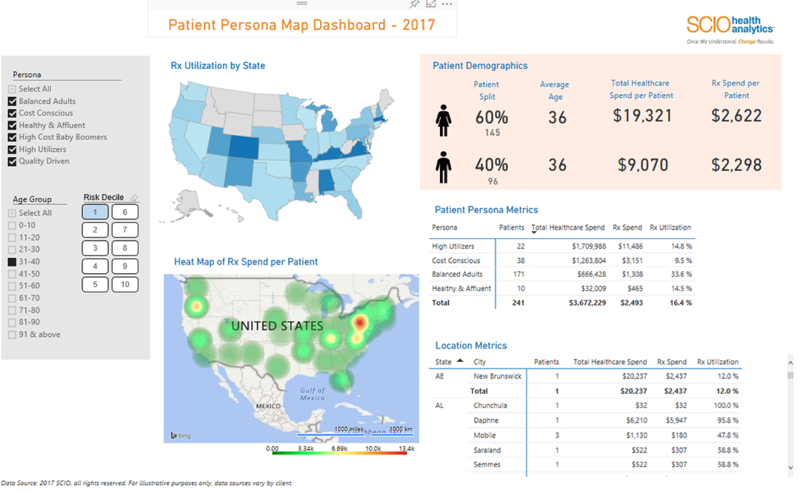 This SCIO Health Analytics showcase leverages patient personas to gain educated information on cost impact. 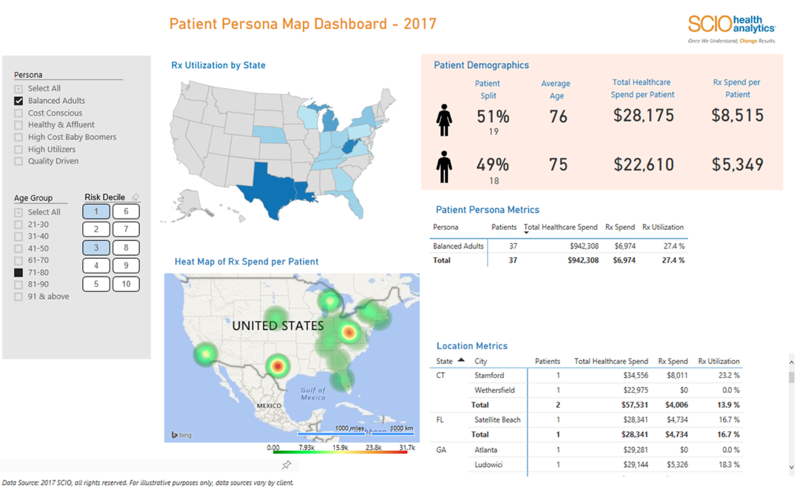 The dashboard visualises spending of various Patient Persona segments against age group and risk scores on a State level heatmap, while also delving into patient demographics and utilization details. 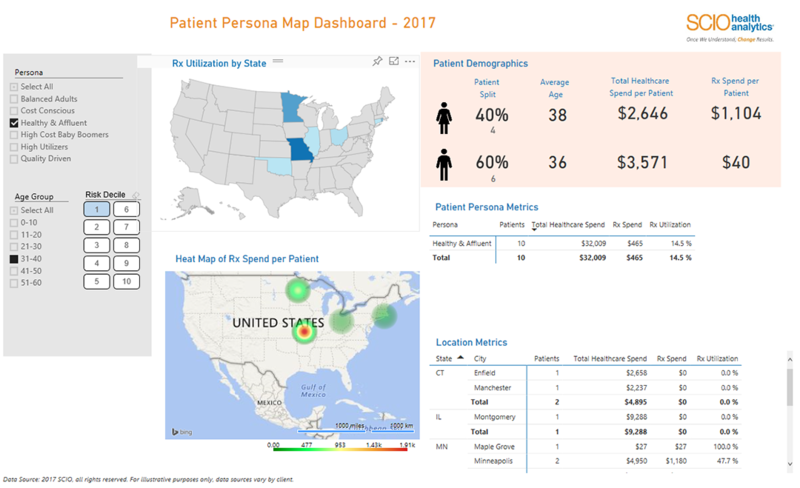 This SCIO Health Analytics showcase leverages patient personas to gain educated information on cost impact. Patient Personas segment patients based on multiple factors, including clinical, prospective risk, demographic, behavioural and financial areas, thereby providing a 360 degree profile of patients within a therapeutic disease area. The dashboard visualises spending of various Patient Persona segments against age group and risk scores on a State level heat map, while also delving into patient demographics and utilisation details. This dashboard helps to identify the future healthcare risks and costs of patients on the basis of their current healthcare utilisation and overall spending. It also allows Life Science organisations to promote more informed communication and identify opportunities to deliver a satisfactory and better patient experience. The first map displays concentration of Rx utilisation by State in terms of total healthcare spend. Users can see utilisation for various patient persona segments further sliced by age group and patient risk deciles. Hovering over a state shows the abbreviated state name and the actual utilisation value in percentage. The heat map below shows a distribution of state-wise prescription spend per patient based on the associated risk scores. The State heat map also allows to seek out states with higher spend by various patient characteristics and can be used to focus on reducing the spending. The KPI section gives a gender-wise snapshot of patient demographics for the country thereby allowing to gauge the overall cost of care and close the gaps. The 2 tables offer detailed metrics on number of patients, total healthcare spend, Rx spend and Rx utilisation by various Persona segments and a further drill-down by State and City.